Are you ready for an unforgettable semester? Spring 2014 is going to be filled with celebrating the LEED Platinum Aztec Student Union and uniting as one Aztec family! We invite you to check out all of the events happening in the First 9 Days @ the Union and Save the Date for the Grand Dedication Week: March 3 – 8, 2014! See you @ the Union tomorrow, starting at 9:00am for the Union Welcome Home Address in the Lee and Frank Goldberg Courtyard, featuring SDSU President Elliot Hirshman and Associated Students President Josh Morse! 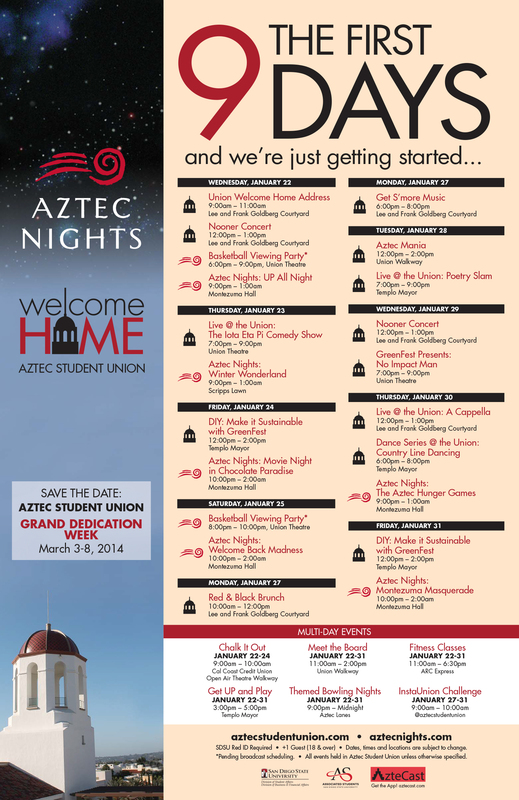 Check out the Aztec Student Union website for additional information regarding the Grand Opening Semester: http://as.sdsu.edu/aztec-student-union/grand_opening.php. This entry was posted in Events, Get Involved and tagged #TheFirst9Days. Bookmark the permalink.